I still don’t have anything definitive to say about the distortion issues so here’s something that has been working for me lately. I’ve been having some mixed feelings about cymbals lately. Well, maybe not lately. I’ve had a love/hate thing with cymbals for a long long time. I’ve often felt like I’ve either got too much or too little in the mix. I’ve experimented with overhead mics, placement, varying amounts of compression, and working on monitor mixes; parenthetically, you do understand that what a musician hears of himself affects the way he plays, right? Regardless of what I’ve tried, I’ve just never had things where I really wanted them. I work with about a half a dozen different drummers on a regular basis. One technique might work with one guy, but not so well with another. Maybe I’m lazy for trying to settle on one approach, but the reality is when you do this every week it’s not so appealing to have to reinvent that wheel every time especially when it could be reinventing it on a nearly daily basis in some seasons. So lately I’ve been trying a new approach…again…that I’ve tried before: under-mic’ing the cymbals. I’ve been listening to some of the official live bootlegs Bruce Springsteen started to put out this year, and they got me thinking about this approach again. 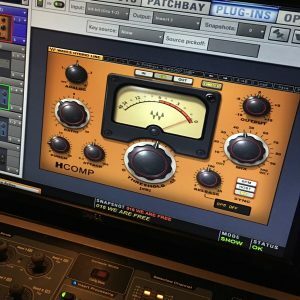 Since I’d read the boots are basically a version of the FOH mix, I asked John Cooper directly about his approach, and Coop gave me some ideas to try. After adapting them a bit for my own use and playing around a bit, I’ve actually been growing to like this a lot. The key for me was all in the mic placement. If the mics are too close to the cymbal they sound weird, and if they’re too close to the center they get really weird. So it took me a couple tries to get them where they sounded like cymbals. Mic selection was also important, and I seem to prefer pencil condensers. I’ve tried larger diaphragm condenser and dynamic mics, but they never did it for me. So I’ve got pencil condensers about 5-6″ below the crash cymbals and ride. I kind of rough in the starting position by putting them about a fist and a half to two fists below the cymbal. Then I put them halfway-ish between the bell and edge of the cymbal. Whenever possible, I tried to mount them so they’ll move with the cymbal if the drummer wants to raise or lower it. I started with some Shure SM-81’s and recently swapped them for some Shure KSM-137’s. The 81’s worked great, but the 137’s have a different clarity and top that I’m liking a little more. 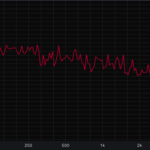 This makes sense because when I look at the frequency response of the 137’s, they essentially have a lift right in the area I was boosting on the 81’s, and I think mics typically sound better when they handle the EQ’ing instead of the desk. Per Cooper’s instructions, I filter the mics really high and compress them a good bit with Waves Renaissance Axe. In terms of the benefits, I feel like I’m getting a lot more control of the cymbals in the mix. I’ve got the crashes folded into a stereo channel with the ride on a separate input which works great for the current style of music we’ve been doing. For example, if we’re doing a song where it’s crash-ride city, I can pull the ride down a bit while leaving the crashes present. Then if we follow that up with a quieter song, I can push the ride back up. It just feels a little more flexible for me. Plus I feel like I can get a lot more of the detail out of the lighter playing now. I also think these close-mics sound a little better with the drums behind a shield. With the overhead mic, I not only get the sound of the drums in the mic, but also the drums reflecting off the plexiglass. 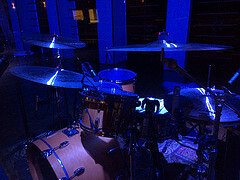 The underhead mics are much closer to the cymbals, though, so the reflections from the glass are reduced in the mics. The downside is that this takes a little more work to get the kit balanced right. With the XY stereo overhead stuff I do, I can really just push the overhead fader up and augment a bit with close mics. But now I’ve basically swapped that for a close-mic approach on all the drums. 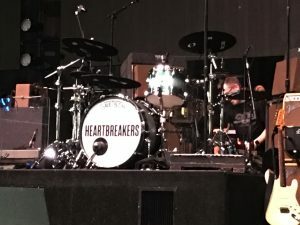 I know close-mic’ing drums doesn’t seem like an unusual approach, but I’ve heard so many guys screw it up that maybe it should be. 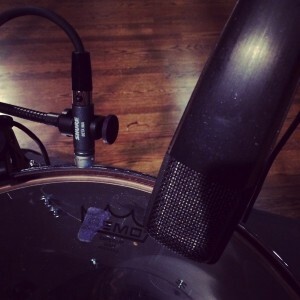 Close-mic’ing a drum kit is basically slicing up ONE instrument into its individual notes and then reconstructing it. It’s like giving every note of a piano or guitar its own input. If I didn’t have a good grasp on what a real drum kit sounds like, I think this would be a challenge. The kit-mic overhead approach, after all, can provide a natural sound of what the overall kit sounds like. But if you’re doing this method, I think you at least have to acknowledge that this is not a natural approach which means it will take more work to make it sound natural. For the time being, I’m still leaving my overhead mic in place. I know there are songs that we’ve done in the past where the overhead mic just worked better stylistically for the song, and I’m sure there will be more of those in the future. Plus, I also think the overhead kit mic might be better for monitors, but I’m working on that a bit to see if I can make these work for the band as well. There’s a small possibility that we’re going to make some changes on our stage in the coming months that might limit our ability to use overheads at all so I want to at least be prepared if that happens. 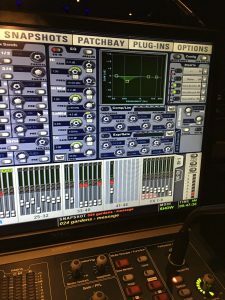 But for the time being it’s underhead mics in the FOH mix and the overheads at monitors….Of course, I’ll probably change this all up again in 6-18 months and talk about how the last approach I tried didn’t cut it…. Good stuff. Stone has it dialed in, and I really liked the mixes at Seeds, though as you mentioned, for some tunes, the overheads still work best. For some tunes I will favor the overheads and then for the more straight ahead rock stuff I pull them back a bit and lay into the close mics more. I think I first heard of Mick (Metallica) doing the under-the-cymbal thing, and I’ve had good results with the ride and hat from underneath with 81s. You’ve got me curious on the 187s now though. And should add that the phase management of the mics becomes more critical in the under style. I am assuming you flipped the phase on all 3 mics? I did flip the POLARITY on the mics. However, I don’t think it’s necessarily an issue in this approach. Most phase problems occur in the lows and low-mids, and I’m not having issues there since I’m pulling them out of the cymbal mics. The mics are so close that they aren’t getting a lot of bleed from the rest if the kit so they’re not combining with much to create phase problems. Been doing underheads for about 6 months now. Works much better in our situation than using overheads. Was just a little tricky at first since the underneath of a cymbal can sound a little washy. Had to take time to find the right placement and use more EQ cuts that I did before. Plus, looks 10x cooler without all the additional clutter around the kit.